Accidentally walked in the Beirut Marathon yesterday. A wonderful, festive occasion, that drew 28,000 registered participants! Wow. First and second place in both the long race and the 10 K were taken by Ethiopians (who had travelled here for the event). Among the other ~27,998 were Lebanese Prime Minister Saad Hariri and a few cabinet ministers, as well as the ambassadors of the UK, Denmark and Belgium. Many roads were closed in Beirut for the event. 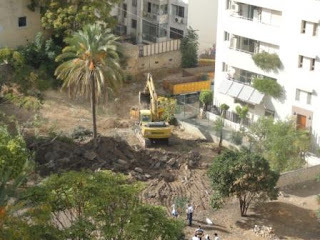 I had tried to go to Meeting up in Broumana, in the hills above Beirut, and had managed this first leg of getting a taxi part way across town to the appropriate bus stop, but after waiting an hour for the bus I gave up. I crossed the street and boarded a bus that normally woud have taken me back to our neighborhood, but yesterday could travel only about half the way. Disembarking at the end of the line I found myself right on the marathon route. In fact my route and theirs was virtually the same; I walked alongside groups of runners and walkers for 45 minutes, passing water sations manned by groups of volunteers, a Scout marching band and other live music along the way. Fun! Heard of but not seen: a 1 km "Run with Mom" race for toddlers, athletes with disabilities, and veteran runners from many countries. A corruption index recently came out ranking Lebanon at 127 out of 180 countries. Could be worse. The ranking makes it more corrupt than Egypt (98th) and Saudi (50th). Iraq comes in at 175th. The index measures the scale of bribery among offiicials. Middle school student leaving a classroom: "Goodbye Miss", "Au revoir madame"
In an email from a hiking group: "Remember to retard your watches by one hour on Saturday"
And in the hair salon: four ladies ahead of me. I don't mind waiting but am witness to their being blow dried, teased, curled and fluffed, only to be smashed down quite violently moments later as the ladies pulled on tight, elasticized head wraps topped with colorful scarves. A fascinating ritual.
. But those buildings are long past the scraping and digging phase, and onto concrete concrete, more concrete, and now two have reached their full height and have their scaffolding down. The scraping is the hardest for me. Obliteration of all things in the target zone, all green and growing things. Particularly: a lovely, beloved, rare tree, a palm, loaded with orange fruits, bulldozed. I see that these large and powerful machines will forever make me think of Rachel Corey, bless her brave heart, Saint Rachel, martyred, bulldozed for a cause in Occupied Palestine, and remembered by me during this local Assault on the Neighborhood, assault on the senses—thamp thamp thamp thamp, scrape scraaaaape, bringing a thin layer of dirt onto every surface of every apartment within four blocks. The palm’s carcass lays off the one side. RIP. I will miss you. I rush to shut all the balcony doors to try to keep some of the fine dust that will come, out. I briefly lament the white blouse I have just hung out to dry in the balcony sun. 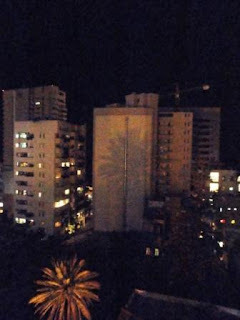 Above is a night time photo of the remaining palm in the area. I don’t dare to contemplate that it, too might be in imminent danger. A friend spoke of the romantic view of Beirut vs. the realistic. It truly is a chaotic mess of a place, seen in a no-doubt too rosy view by those of us who finds it’s thrill appealing. I for one relish the freedom behind the chaos, the wild abandon with which one could conduct oneself, free of most formal, or at least enforced, laws of conduct. There is a delicate, understood order that holds the place together, part genuine politeness, part common sense, part plain survival. The dog poo on the sidewalk is not pretty, but the Filipino maid who allowed the animal to poop knows she can rely on the Sri Lankan sanitation worker to clean it up, eventually. You can park your car on the sidewalk unless thick metal poles have been installed to prevent it. A new skyscraper comes up, blocking the view of everyone behind it—it is all God’s will, anyway. Something I never, EVER EVER thought I would do: be a substitute teacher. Horrors! I had recently said I was willing to sub for the ESL teacher, who works with individuals or small groups. But they called me for a regular sixth grade English class. It was laid at my feet in the most gentle way possible…. I was asked on a Friday, so had the whole weekend to ponder the idea, was given five classes over two days, two of which are repeats of the same lesson, which is largely on Powerpoint, and two are class library times where I don’t have to teach AT ALL. Clearly I am supposed to do it. A man driving a stick shift car along the Corniche. A fidgety 3 year old boy is in his lap, and holds a liter sized water bottle. Another child, around 7, is in the passenger seat. I see them at a stop light (yes, Beirut does have a few now, mostly obeyed). The man tries to put 3 year old down but there is no room; he resettles him behind the steering wheel. May Allah protect them.